The derailleur system was introduced to the Tour de France in 1937, allowing riders to change gears without having to remove wheels. Previously, riders would have to dismount in order to change their wheel from downhill to uphill mode. Derailleurs did not become common road racing equipment until 1938 when Simplex introduced a cable-shifted derailleur. 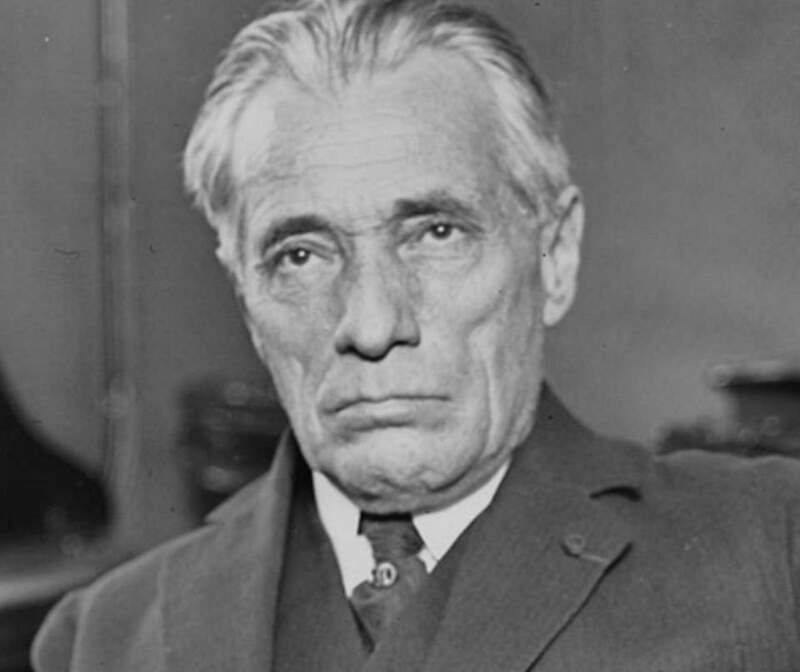 Henri Desgrange (31 January 1865, Paris – 16 August 1940, Beauvallon) was a French bicycle racer and sports journalist. He set 12 world track cycling records, including the hour record of 35.325 kilometers on 11 May 1893. He was the first organizer of the Tour de France. He was the “patron” of the Tour until 1936. Gear changing systems already existed before 1937. But, Tour de France organizer Henri Desgrange has had strict rules. Once he said that his ideal race would be so hard that only one rider would make it to Paris. 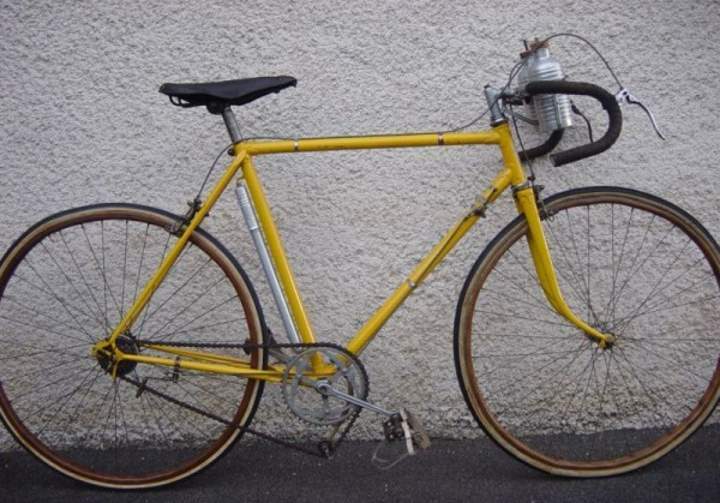 Desgrange was also a traditionalist with equipment. Until 1930 he demanded that riders mend their bicycles without help and that they use the same bicycle from start to end. Exchanging a damaged bicycle for another was allowed only in 1923. Desgrange stood against the use of multiple gears and for many years insisted riders use wooden rims, fearing the heat of braking while coming down mountains would melt the glue that held the tires on metal rims (they were finally allowed in 1937, after Desgrange retired from organizing the Tour de France). Roger Lapébie’s 1937 Tour de France victory was controversial as he was the first rider to complete the race using a modern derailleur. This gave him the advantage of shifting gears without having to stop, dismount and flip the wheel as was customary of racing bicycles used at the time. 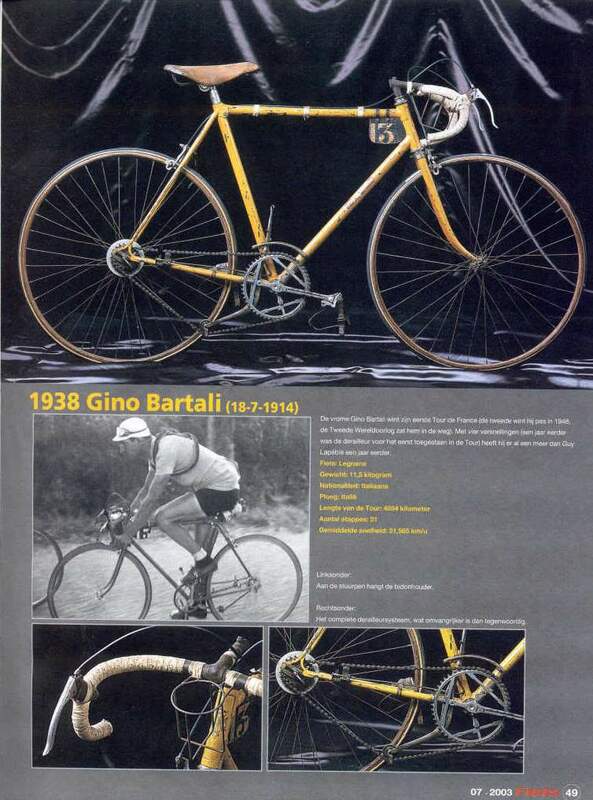 Gino Bartali’s Tour de France 1938 winner bike – a Legnano equipped with Vittoria Margherita groupset. Unlike the Tour, the derailleurs were allowed in the Giro d’Italia. The great Italian rider, five-time Giro winner and the first UCI World Champion, Alfredo Binda also used the Vittoria gear changer while winning his third UCI World Championship in Rome in 1932. 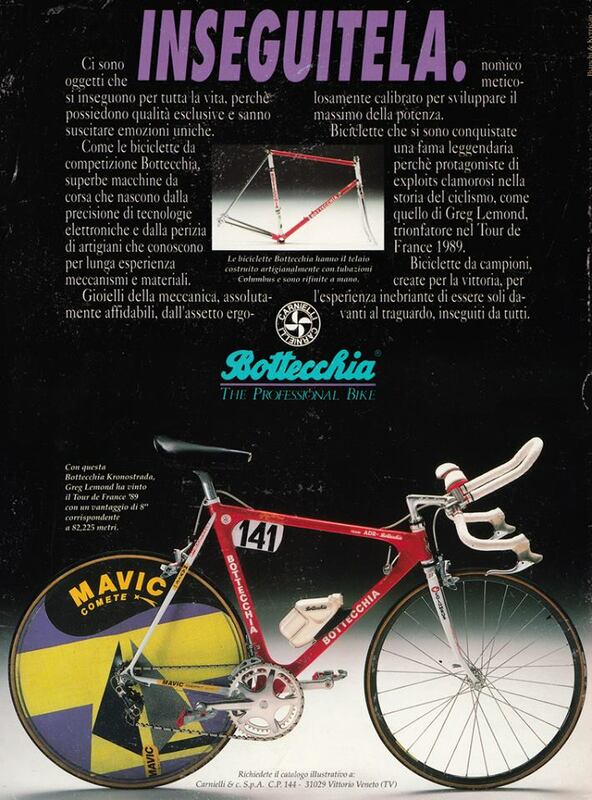 From 1935 and on, Vittoria systems called Vittoria Margherita. They had a rod-controlled pusher on the chainstay that would move the chain while the rider backpedaled. 1946 Campagnolo Apo Lazarides (France) ? / ? 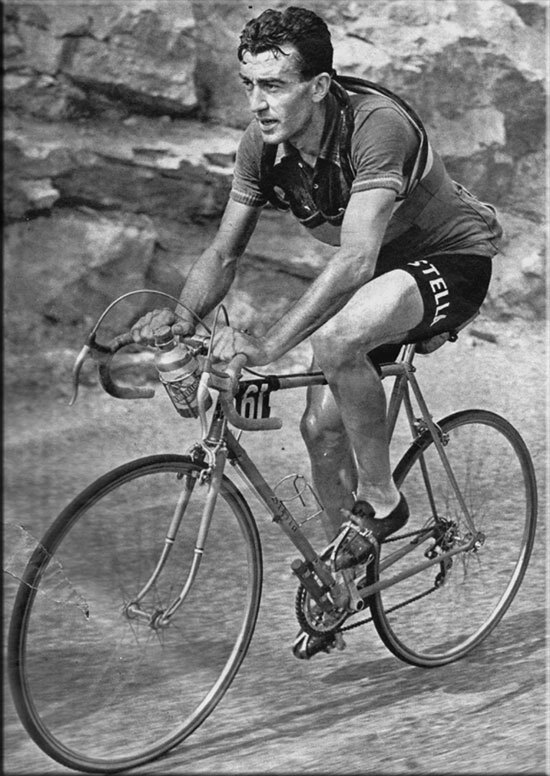 Gino Bartali (Legnano) shifting the Campagnolo Cambio Corsa during his 1948 Tour de France win. A Legnano equipped with Campagnolo Cambio Corsa groupset. 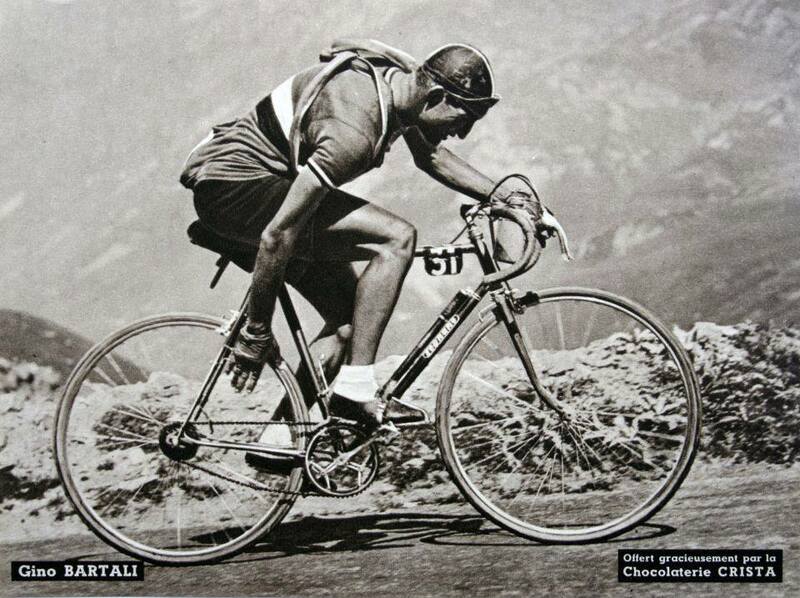 Louison Bobet riding his Stella bike (Stella badged but constructed by Camille Daudon) during 1953 Tour de France. Equipped with Huret groupset. 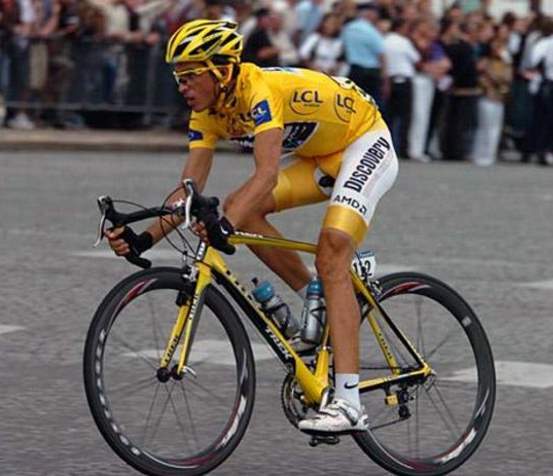 Alberto Contador (Discovery Channel) riding his Trek bike during 2007 Tour de France. Equipped with Shimano Dura-Ace groupset. Alberto Contador (Astana) riding his Trek Madone on Mont Ventoux climb during 2009 Tour de France. Equipped with SRAM Red groupset. The Course du Tour de France (English: Race of the Tour of France), also known as Monaco–Paris was organised in 1946 by Le Parisien Libéré together with l’Equipe. 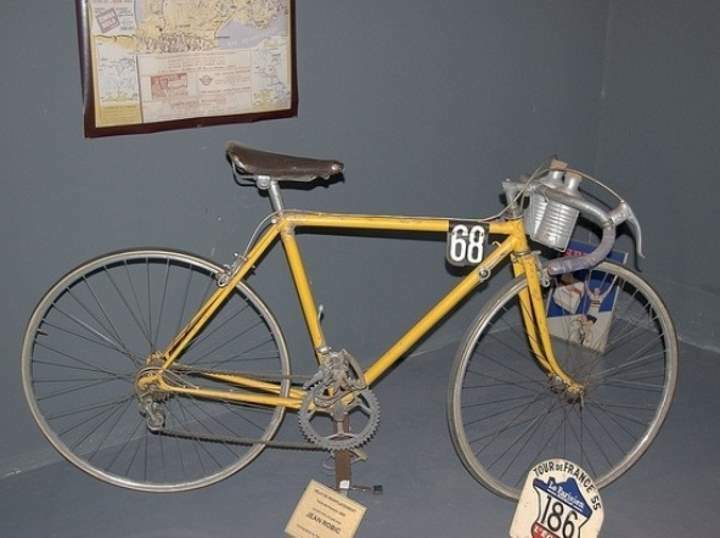 The race had many things familiar to the old Tours de France: there were six national teams and five regional French teams, and the leader in the race was also given a yellow jersey. The race was won by French cyclist Apo Lazarides. If we exclude 1946 “Monaco–Paris”, Campagnolo has 40 Tour de France victories. Lance Armstrong has been stripped of his seven Tour de France victories. He was using Shimano groupset.